Start the program by double-clicking on the varsannotation-video.jnlp. 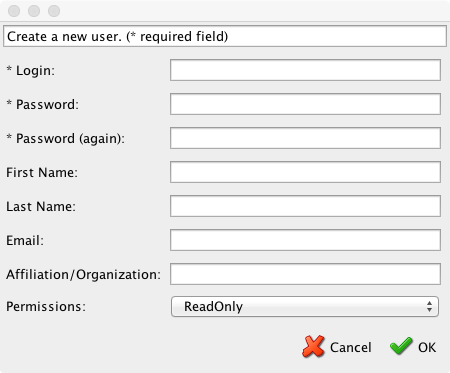 After the knowledgebase finishes loading, the annotation interface opens. 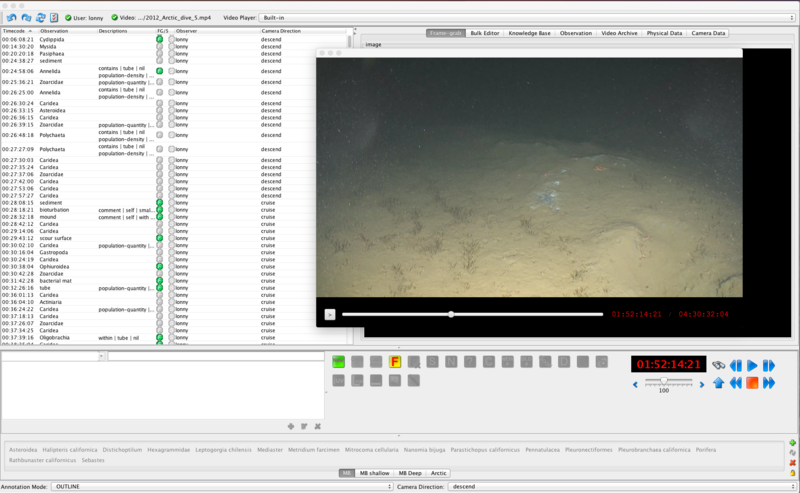 To begin using VARS for video files, you must first login, then open the video file that you wish to annotate. 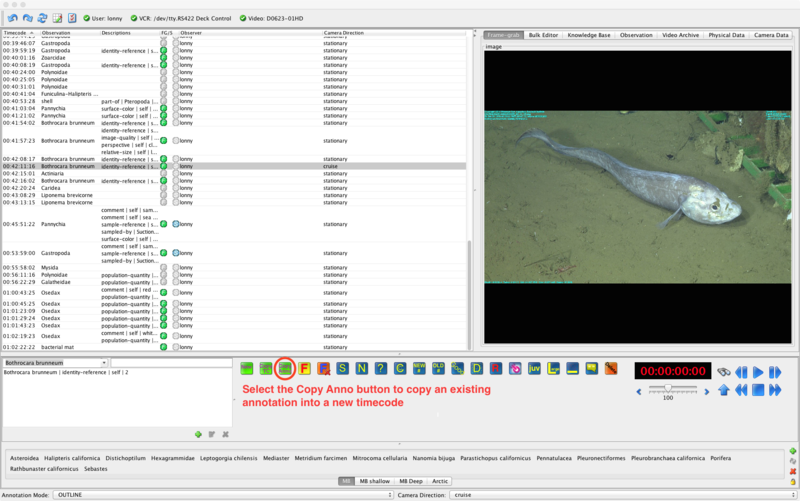 To open new video files select open by location, browse to and select the video file you wish to annotate and choose open then select the ROV name from the camera platform drop-down menu and enter the dive number into the sequence number box. 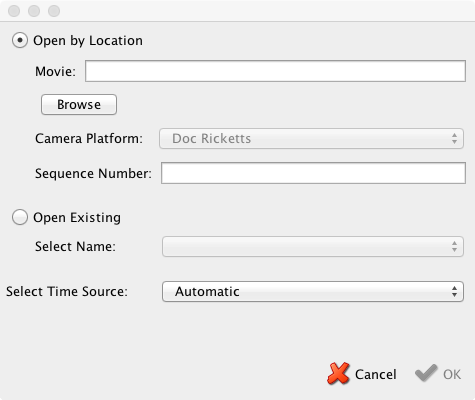 To open a previously annotated video file, choose open existing and select the name of the file you wish to re-open. Select a timecode source, choices include automatic, timecode track, or elapsed depending upon needs and file source. Press OK. Under video player, you may choose to play videos using the built in player or the Quicktime component. The video player you select will depend upon the video container and codec that you are using. Click on the New button (or ctrl+N / cmd+N). A new line will be created in the observation table with the default object in the observation column and with the current video file timecode. Type the concept name in the editor and press Enter. The new concept name will be updated in the observation table. For faster annotations see information below about a custom icon panel. To create an annotation associated with a frame grab, click the frame grab (F) button (or ctrl+F/ cmd+F ). The frame grab will be displayed in the upper right corner of the user interface, under the Frame-grab tab. By default, the concept physical-object will be entered in the observation column. 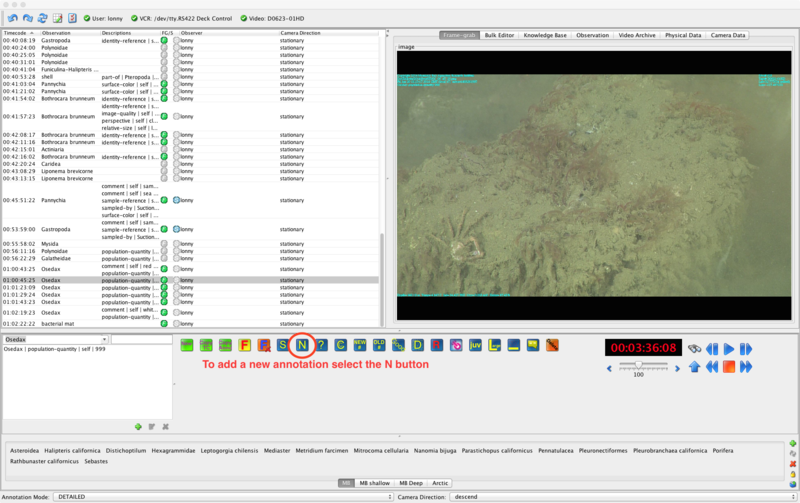 The F button in the FG/S column of the observation table will be highlighted in green, indicating there is a frame grab associated with this observation. For additional help with the VARS Annotation Interface, email the video lab administrators or call 831-775-1829. For help with technical issues, email Brian Schlining.